Here on the blog, we have already taken a closer look at some of the top inks to use as a beginner for broad edged calligraphy, as well as, instructional books which cover the topic in greater detail. Now, one of the most important choices to make which will effect both the style and outcome of your work, is what type of nibs you will use. Luckily, broad edged doesn’t have quite the same amount of almost overwhelming options as pointed pen. However, there are still enough options which can leave a beginner calligraphy student confused as to where they should start. 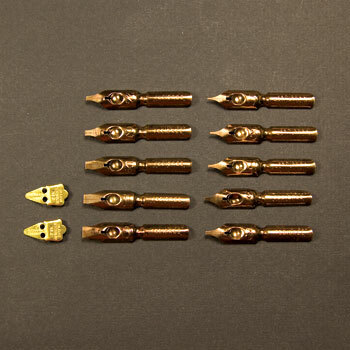 N02 Brause Calligraphy Nibs– These nibs are available in 9 different sizes ranging from 0.5 mm to 5.0 mm, which gives them quite a bit of versatility for an array of projects or simple practice. 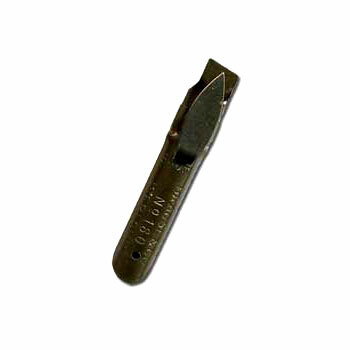 Brause nibs are well made and hold up excellently to repeated use. Use these for Blackletter, Italic, and many other calligraphy hands. Brause nibs are a very stiff nib, which means they are a fantastic option for those who write with a heavy hand. On the flip side, those with a lighter hand, may find that they can be more challenging to use. N04 Mitchell Calligraphy Nibs (Round Hand)– These nibs from Mitchell are available in 10 different sizes and offer much more flexibility while writing than do the Brause nibs. Mitchell nibs are also a good option for Italic and Blackletter, in addition to, Uncial, Foundational hand, Roman Caps, Carolingian, and others. The flexibility of Mitchell nibs can present problems for some people (beginners and those with a heavier hand), so it may be a good idea to experiment with both the Brause and Mitchell to see which fits your individual needs. 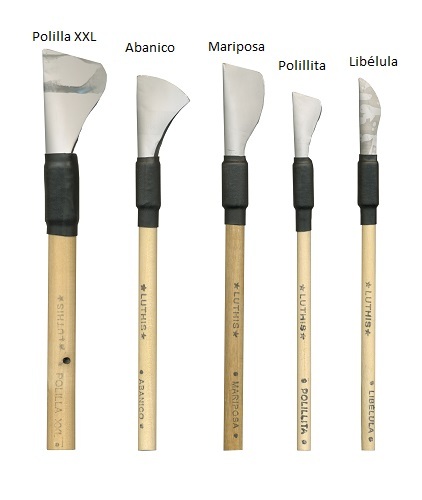 N155 Luthis Pens– While not a separate nib, Luthis Pens offer an exciting and creative way to practice broad-edged calligraphy. As seen above, Luthis Pens come in five distinct styles and are a great way to add some more expression to your lettering. While one shouldn’t shy away from trying out new things, it is probably best to build some comfort and put in some practice with the Brause and/or Mitchell nibs first before branching out further. However, the Luthis Pens are a great way to add some individualistic style to your work. There are more broad edged calligraphy nib choices on our website. Whether you are learning on your own, taking an online class, or are face to face with an experienced teacher, it a necessary to have the right tools in order to reach your highest potential.